Which team are you? Are you #TeamSuperCheese or #TeamSourCream? There are two new and exciting ways to enjoy your favorite Jolly Crispy Fries: through generous sprinklings of cheesy Super Cheese and delicious Sour Cream! The Jolly Crispy Flavored Fries are fast becoming the favorite snack to share! The new Jolly Crispy Flavored Fries Super Cheese and Sour Cream are available in three sizes: regular (P40), large (P65), and jumbo (P80). These tasty snack treats are also available in the refreshing Jollibee Float combo, starting at P65. The new Jolly Crispy Flavored Fries are now available in all Jollibee stores nationwide. Are you #TeamSuperCheese or #TeamSourCream? YouTube stars Wil Dasovich and Janina Vela, as well as Loyola Meralco Sparks FC players James and Phil Younghusband, Simon Greatwich, Eddie Mallari, Anton Del Rosario, and Curt Dizon are among the celebrities who are loving the new Jolly Crispy Flavored Fries. On May 4 at 2 – 3PM, you get to choose which team you’re on! 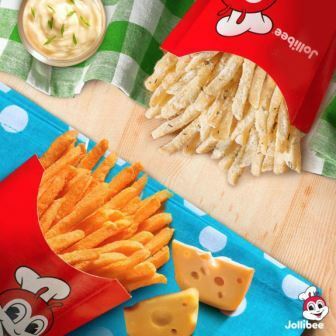 140 Jollibee stores nationwide will participate in a grand sampling event for everyone to get a taste of the new Jollibee Crispy Flavored Fries in irresistible Super Cheese and Sour Cream flavors. So on which #JollyCrispyFlavoredFries team are you? 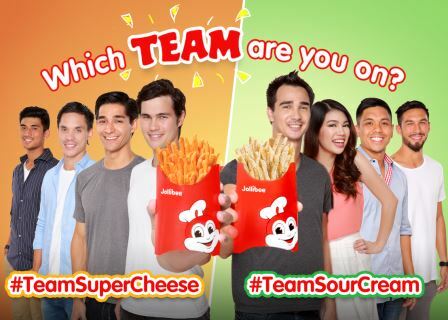 Try the new flavors and tag @bestfriendjollibee on Instagram with the hashtag #TeamSuperCheese or #TeamSourCream! You can also like the Jollibee Facebook page at http://facebook.com/jollibeephilippines and follow Jollibee on Twitter @jollibee.